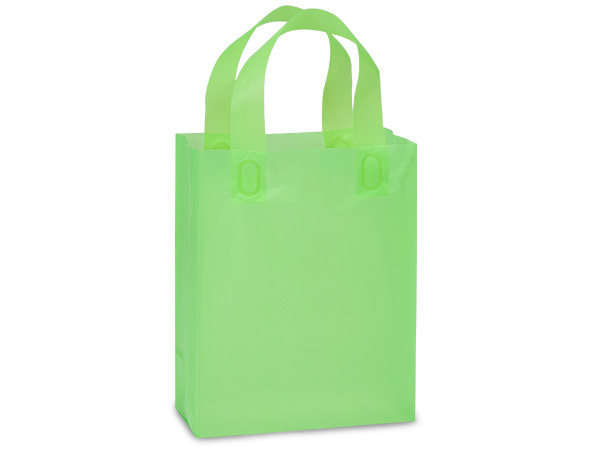 Jewel 4 x 2 x 5" Rose 5 x 3 x 8" Cub 8 x 4 x 10" Vogue 16 x 5 x 12"
Key Lime Cub sized plastic gift bags are made from 3 mil plastic and have soft loop handles. Bags measure 8x4x10" and are sold in a bulk carton of 200. Our Color Plastic Gift Bags are made of deluxe 3 mil hi-density polyethylene with matching 6 mil soft loop handles. Heavy cardboard bottom inserts give bags extra strength. An economical way to package your gifts. These bags are recylclable and reusable. Great quality!